A vigorous evergreen, prostrate ground cover with dense sprawling green foliage, red stems and very colourful flushes of magenta open faced flowers from summer to autumn. This is a deservedly popular ground cover that prefers a warm climate and will not tolerate frosts. 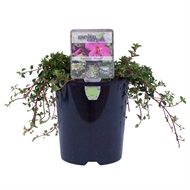 Grows to 15-20cm high spreading to a minimum of 50-60cm wide.